There was a time not long ago when Poland’s political leadership was jokingly dubbed “Donald and the Ducks.” The “Ducks” (Kaczy) were twin brothers Lech and Jarosław Kaczyński, who founded and ruled Poland’s far-right Law and Justice (PiS) party. Opposing them was Donald Tusk, who founded Poland’s center-right Civic Party (PO) and served as Prime Minister from 2007-14. Lech Kaczyński died in the 2010 Smolensk air disaster, and his brother is currently the de facto leader of the country. Donald Tusk spends most of his time in Brussels these days as President of the European Council since 2014. Nevertheless, for better or worse, his legacy continues to color Polish politics, and he remains perhaps the one man Jarosław Kaczyński fears. And this afternoon he visited Krakow’s Main Square, surrounded by an eager crowd of supporters. Tusk was in town at the invitation of Bishop Tadeusz Pieronek for a conference on the role of the church in European integration. The 61-year-old former PM joked with his audience about the welcome, which TVN24 compared to a rock star’s, saying that it was even warmer than the one his family in Sopot gave him. So, what did Donald Tusk talk about? 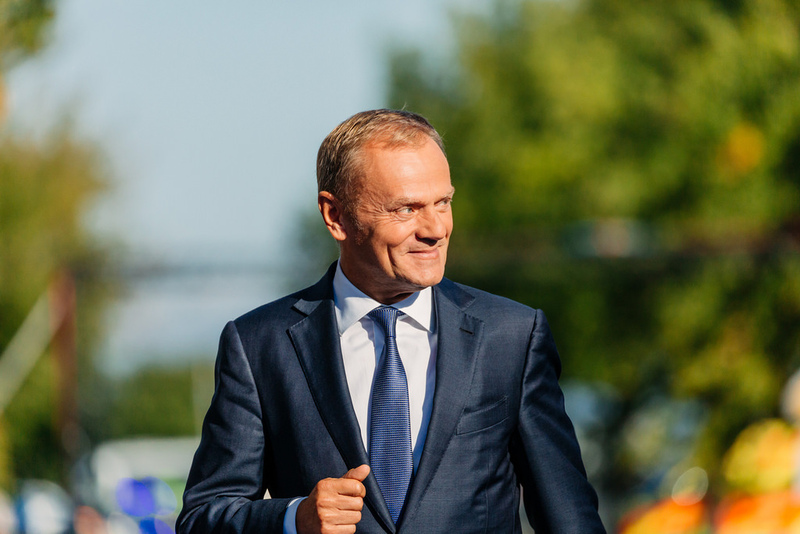 As the Predident of the European Council, Tusk was eager to defend the record of the European Union and to encourage Poles to support it. He said that the migration crisis sparked by conflict in Africa and the Middle East had passed its peak, applauding the fact that the EU had handled it without turning to ultranationalism or racism. He also referred to the UK’s ongoing Brexit woes as a cautionary tale which, he argued, should encourage Poland to take more responsibility for the European project. Tusk also had words of warning regarding the other famous Donald, US President Trump. He characterized Trump’s cooling on NATO and talk of tariffs against EU countries as archaic, and worried that at the same time the US was moving closer to Russia. Referring to the aforementioned conference he had just attended in Krakow, Tusk also reminded his audience that Pope John Paul II – widely revered as a national hero – had been an enthusiastic supporter of Polish membership in the European Union. Tusk went on to express fears that Poland was more divided than any other country in Europe, even comparing the situation unfavorably to the countries in the Balkans which he had recently visited. He invoked the 100th anniversary of Poland’s regaining independence, coming up on 11 November, as an exhortation toward national unity. 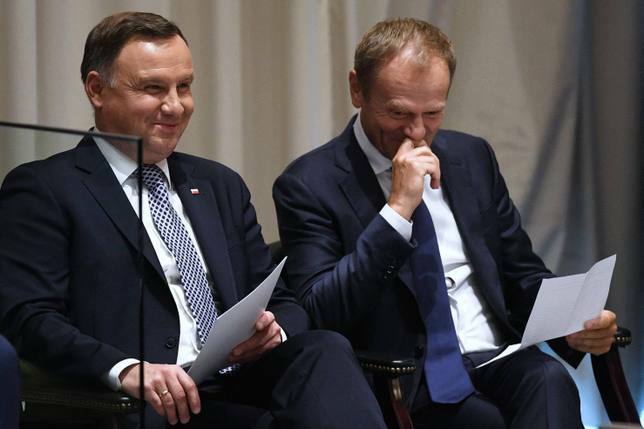 On lighter note, Tusk spoke about a video of him and current Polish President Andrzej Duda bursting out laughing together at the recent United Nations General Assembly meeting. At first, the topic of their conversation had been unknown, and the image quickly became a sensation as Poles tried to guess what the two ostensible opponents were giggling about. 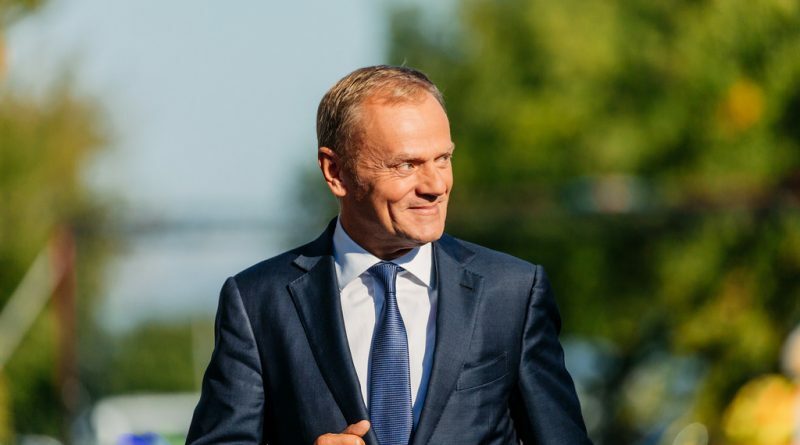 Tusk clarified that they had probably been expressing solidarity about Duda’s anxiety about winning a second five-year term in the 2020 Polish national elections. When Tusk had been Prime Minister, he said, he had not been confident enough to rent out his apartment for 10 years – unlike his fellow party member Bronisław Komorowski, who did so and then was voted out in favor of Duda after just five years as Polish President. Zuza Buchowska contributed to this story. Last time I checked, Tusk was considered almost a traitor to the polish people. I’m so glad Poland has woken up, taken the red pill and no longer bends to the EU or the islamists who are invading Europe. Narodowa duma! Yes, Sobieski who saved… Austria from the Turks then spent more than a decade doing nothing. Your comment rather proves the point I made earlier. For all the millions of Polish people who have regarded – and still regard – Sobieski as a hero, there will always be those who see him in a less flattering light. If you want to re-write history, you need to offer something more than “loser”. Sobieski a loser. Welcome to the new Polish history.